It then continues... "Soka Gakkai is a shadowy case in point"... The word "shadowy" sets a dark and sinister tone... a good choice, considering you couldn't start the piece off with "It was a dark and stormy night..."
"...A nasty split from Nichiren Buddhists set off a cycle of alleged violence, blackmail and intimidation. 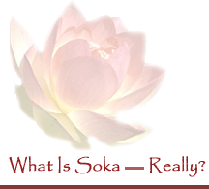 Soka Gakkai members in Japan have been charged with illegal wiretapping and breaking into private databases..."
You then use rabid "anti-Gakkai" website owner Lisa Jones' definition of "Many in Body, One in mind" as meaning: "...You have to make sensei's [teacher's] heart your own. You have to fulfill [Ikeda's] dreams instead of your own,"
Ikeda said in 1990: "The purpose of Buddhism is not to create dupes who blindly follow their leader... it is to create people of wisdom who can judge right and wrong on their own in the clear mirror of Buddhism..."
"...The veil that surrounds the nonprofit world, especially religions, ensures that only the outlines are visible..."
See also about the press.